In most experimental studies of tax evasion, participants are instructed that they may report any amount of income from zero up to the amount they actually earned or received. This amounts to an invitation to gamble. In contrast, real-world tax authorities unambiguously demand compliance. We develop two new settings for conducting tax experiments. Both involve an explicit demand for compliance. Thus, we can determine whether knowing that the experimental authority would regard evasion as wrongful disobedience will influence compliance decisions. 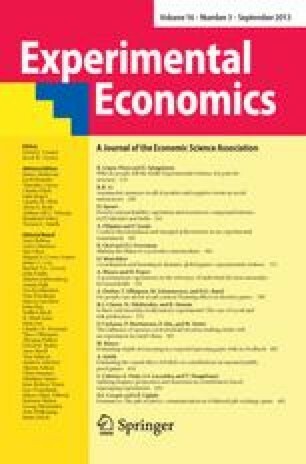 We demonstrate that simply telling people that they are required to pay a “participation fee” analogous to a tax produces remarkably high compliance rates and less sensitivity to changes in economic variables than in the earlier experimental literature using invitation-to-gamble language. This suggests that many people pay taxes despite the financial attraction of non-compliance because they are strongly inclined towards obeying authority. Furthermore, we show that giving participants a week to make their reporting decisions at home without an authority figure physically present overcomes the inclination to obey for some people, significantly lowering compliance rates. However, the majority still complies, even after the audit rate falls from 25% to 1%, which would make non-compliance extremely attractive if it were viewed only as a simple matter of risk and expected return. Electronic Supplementary Material Supplementary material is available in the online version of this article at http://dx.doi.org/10.1007/s10683-006-7053-8 .